About Wand Warehouse: Personal Handheld Massagers For Sale Australia Wide. The health benefits gained by having a massage have been well documented by Doctors and Physiotherapists. With advances in modern technology, an amazing range of handheld personal massagers is now available for consumers across Australia to buy. Wand Warehouse is proud to offer over 200 personal massagers covering plug in massagers, USB rechargeable massagers and battery powered massagers; in a range of colours to enable both men and women to massage away stress and soreness. Wand Warehouse was set up to provide Australian consumers an easy way to buy handheld massagers at discounted prices. Importing only the highest quality personal massagers from all over the world, consumers can now choose from over 200 handheld massagers and purchase them conveniently online 24 hours a day, 7 days a week. There are massagers to suit all budgets and requirements; whether you’re wanting to relieve stress, soothe tired muscles from a hard days work or recover from a sporting injury. You will also find the highest quality massage oils, massage lotions and personal lubricants to enhance the pleasure from your personal massager or body massage wand. Le Wand luxury handheld massagers tick all the boxes. Already a popular choice with women, men are buying Le Wand for massaging tired shoulder, neck and leg muscles. Made from the highest quality materials and parts, the Le Wand massager features 10 massage intensities and 20 patterns so there is sure to be a setting to suit everyone. Ring massagers are not new to the world of personal massagers, but the WowYes Liana is considered the pinnacle of ring shaped personal massagers for women. Surprisingly powerful considering it’s dainty size, this ring massager slides easily onto almost any finger to add extra enjoyment to any massage experience. With many customers asking for a lubricant to use in conjunction with their personal handheld massagers, we searched the world, testing hundreds of brands, before deciding to stock the ID Lubricants range of personal lubricants. These water based lubricants are safe to use with all silicone handheld personal massagers. Personal lubricants act as a medium between personal massagers and the nerve endings in the tissues to allow the body to feel every quivering vibration to it’s fullest! With a range of traditional water based lubricants, warming personal lubricants and tingling lubricants to choose from, ID Lubricants can help to transform an everyday experience to one of pure bliss! Handheld rechargeable massagers offer customers the very best in convenience, portability and power. Ideal for soothing tired muscles, the Fare L’Amore Wanda is a strong and reliable body massage wand that is a hit with men and women alike. The silicone massage head features a flexible neck, allowing better access to every angle of the body. The Kama Sutra luxury romance collection includes an exquisite range of aromatic massage oils and massage oil candles to inspire relaxation and tranquility. Formulated to leave the skin feeling healthy and looking beautiful, this enticing range of massage oils and lotions provides the highest standard of pampering you can experience in the comfort of your own home. The exquisite spa collection by Kama Sutra can help you to relax and unwind after a long stressful day. Enjoy a relaxing bath with the Kama Sutra Treasures of the Sea Bath Salts or enjoy an indulgent shower session with the deluxe range of Luxury Bathing Gels. Complete your spa experience by pampering yourself with the corresponding massage body lotion. Ideal for tired muscles, Wanachi make a range of strong and reliable battery powered massagers. 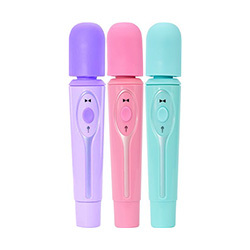 The battery powered Mini Wanachi body massage wand features a waterproof battery compartment, meaning the wand can be used in the bath or shower for a truly relaxing home spa session. The RO-LO body massager is a firm favourite with couples. Perfect for giving a loved one a thorough back massage, this handheld massager helps take the guess work out of your massage session. With just a few drops of massage oil or personal lubricants, this body massager will glide across the skin as it pulsates tired muscles. Vive are famous for their design and workmanship. Ideal for tired muscles, the Vive Shiatsu is strong and reliable. The unique silicone nodules spread evenly across the massage head work to send the vibrations deeper into the tissues, thus setting Vive apart other massage wands. If you want the same massage experience but would like something a little smaller, then the Vive Enoki is a more petite version that still provides a powerful massage. On the cutting edge of innovation and technology, Romant produce luxury personal massagers for women as well as powerful body massage wands. Beautifully packaged and made from the highest quality silicone, this French designed collection of handheld massagers certainly have a romantic air about them. Rollerball massage gloves are a simple way to give your partner a massage. Ideal for a quick invigorating back massage, these gloves fit most hand sizes and are flexible enough to work around the curves of the body. Stylish his and hers body massage wands; Boom Ayla is one of the best performing battery powered massagers on the market. Made from hygienic dust free silicone and featuring a stunning timber-look trim, this massage wand is the natural choice when it comes to style and stamina. Great for the beginner thanks to it’s ease of use, and perfect for those who demand true intense power, Palm Power massagers comes as plug in and USB rechargeable versions. The handle is sized for easy handling before it gives way to a super-sized motor and a powerful massage head. Suitable for any part of the body in need of some care and relaxation, Palm Power massagers are a great choice for those who think they might forget to buy batteries. Charmers cordless massagers for women come in 3 fashion colours. Perfectly sized to contour the curves of the body, the Charmer range of body massagers are ergonomically designed to snuggle up against even the trickiest of trigger points. Fitting in your handbag, Charmers personal handheld massagers are perfect to take; where ever you go. Key by Jopen Virgo is one of the best selling personal handheld massagers for women. With style and functionality at the forefront of every design, these body massagers are meticulously crafted to provide a natural and effortless massage experience. Available in 3 stylish colours, Key by Jopen is a reliable choice. BodyWand, perhaps the most famous brand of handheld massagers are available in a range of styles, sizes and power alternatives. From plug in massagers through to handy ‘pocket’ sized body massagers, all BodyWand massagers are made with the same high standard of performance and reliability. BodyWand also have a range of gift sets, catering for all occasions. PowerBullet has a reputation for producing the most powerful mini massagers available. Featuring the famous PowerBullet vibration technology, vibrations are delivered from the powerful motor deep into the tissues. One of the most popular personal massagers for women, PowerBullet personal massagers come in a huge range of sizes and colours to suit every need.